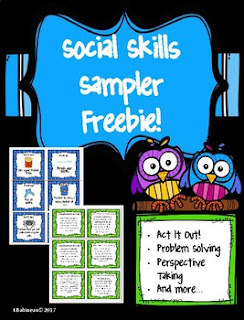 This Social Skills Sampler Freebie contains a variety of social skill cards that are fun, and target areas that are challenging for many of our students with social pragmatic difficulties: body language, facial expression, identifying feelings, problem solving and role-playing. To use these cards, simply print, laminate (if desired) and cut apart. These are fun to use in small groups, and can even be used with whole classes during morning meeting, circle time, or during transitions. I hope you enjoy this activity and find it helpful for you and your students.